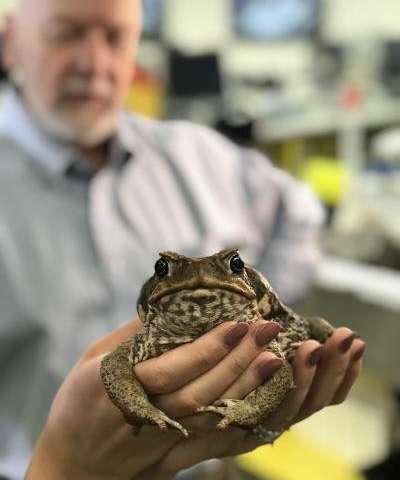 "Despite its iconic status, there are major gaps in our understanding of cane toad genetics, and up until now, no one had put the genome together," says Peter White, project leader and Professor in Microbiology and Molecular Biology at UNSW. A decade ago, researchers in WA had already tried to sequence the cane toad genome, but they encountered obstacles when it came to assembling it, and didn't complete the project. "Sequencing and assembling a genome is a complicated process. By using the cutting-edge sequencing technology and expertise available at UNSW, we sequenced 360-odd billion base pairs and assembled one of the best quality amphibian genomes to date," says Senior Lecturer Dr. Rich Edwards, lead author of the study. "We managed to decipher more than 90% of the cane toad genes using technology that can sequence very long pieces of DNA, which makes the task of putting together the genome jigsaw much easier." Having a draft cane toad genome will help to close key knowledge gaps and accelerate cane toad research. More toads can now be sequenced at a fraction of the cost, and the genome is freely available—anyone can access it now and conduct further research. "Future analysis of the genome will provide insights into cane toad evolution and enrich our understanding of their interplay with the ecosystem at large—it will help us understand how the toad spreads, how its toxin works, and provide new avenues to try to control its population," says cane toad expert and Emeritus Professor Rick Shine from the University of Sydney. "Very few amphibian genomes have been sequenced to date, so this is also great news for amphibians. Having a reference genome could provide valuable insights into how invasive species evolve to adapt to new environments." "Current measures like physical removal haven't been successful, but new methods to teach native species not to eat the toad—called taste aversion—give new hope. However, we need more approaches to control this invasive species," Professor White says. For one such alternative measure—biocontrol, i.e. using a virus to help control the toad population—the toad's genetic material is essential. "To find a virus for biocontrol, we need access to the toad's DNA and RNA," explains Alice Russo, a Ph.D. student at UNSW who specialises on finding potential viruses to control the toad. "DNA contains ancient fragments of viruses—the DNA of every animal can sometimes catalogue past infections." Viruses have previously been successfully used to control the European rabbit population. The issue with cane toad viruses studied so far was that they could potentially infect native amphibians—which is why this study aimed to find a cane toad-specific virus. "Up until we published this paper, only one family of viruses was known to affect the cane toad. This is the first paper that has found different viruses, which is very promising," Russo says. "This paper has opened the door: we found a retrovirus, a picornavirus and a circovirus which are genetically similar to viruses infecting frogs, reptiles and fish. For two of them, we found a full genome—both could potentially be used as biocontrol agents." "There's a lot more work to be done. However, these two papers are the first—but most important—steps in finding an effective way to control the cane toad," Professor White concludes. Cane toads are highly adaptable and have destructive impacts on native fauna in invaded regions, of which there are many; they are present in 138 countries. Since the toad was introduced in Queensland for control of the cane beetle in 1935, it has spread widely—millions of toads now occupy more than 1.2 million square kilometres. It fatally poisons native species like the northern quoll, freshwater crocodiles, and several species of native lizards and snakes.